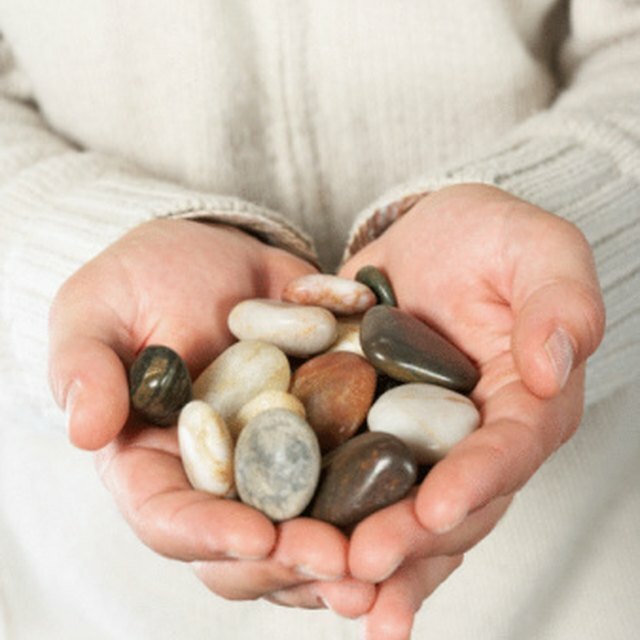 River rocks are easily polished in a standard rock tumbler and are commonly used in indoor and outdoor decorating, as massage stones or in metaphysical crystal healing. River rocks can be purchased online, in various stores worldwide or can be collected by hand along any river. Polishing river rocks takes time, generally more than a month, with the exact time determined by the hardness of the stone. Stones can be altered to personal preference by alternating the size of the abrasive grit and the number and duration of tumbles. Mix river rocks, water (level with the top of the rocks) and 4 tbsp. of abrasive grit in the rock tumbler. Turn on and tumble for one week. The size of the grit matters; start with large grits and work your way to finer grits to customize the rocks. Remove the rocks and wash them in room-temperature water. Allow them to dry thoroughly as rocks alter in appearance when they are wet. Repeat steps 1 and 2 until you attain the desired smoothness and shape. The goal is to have rocks without scratches of any kind so that the polish takes. Place smooth, shaped rocks into the tumbler. Add 3 tbsp. pre-polish and water. Tumble for 10 days. Remove the river rocks and wash again. Place rocks, water and 2 tbsp. of polish into the tumbler and tumble for two weeks. Remove the rocks and wash again. Place the rocks into the tumbler for a final time. Add water and a bar of Ivory soap. Tumble for three hours. Remove and wash the stones. The river rocks are now smooth, shaped, polished and ready for use. If the noise of the tumbler is bothersome, move it where you cannot hear it like a garage or basement. Rock tumblers are available in a kit. Do not put river rocks smaller than ¼ inch in diameter, broken or jagged into the rock tumbler. A tumbler barrel should never be more than 2/3 full. Rocks that do not take polish were likely either in an overfilled tumbler or must be tumbled with grit again to ensure that they are free from scratches. Rae, Kara. "How to Polish River Rocks." Sciencing, https://sciencing.com/polish-river-rocks-6368725.html. 24 April 2017.